Yesterday I got a sneak peak at the new restaurant GRAZE coming to the Whole Food’s shopping Center off Houston North Cutt in Mt. Pleasant, Sc. The formerly Coco’s space is getting a major facelift thanks to the hard working owners who cleverly hired designer Erika Nadolny to get the right look. I caught up with the team and Erika as they were doing their last minute tweaking before a planned opening in mid September. Erika’s design is both elegant and earthy. She did not draw inspiration from other restaurants but pulled ideas from basic shapes, textures, and objects. Erika works in a very collaborative way. 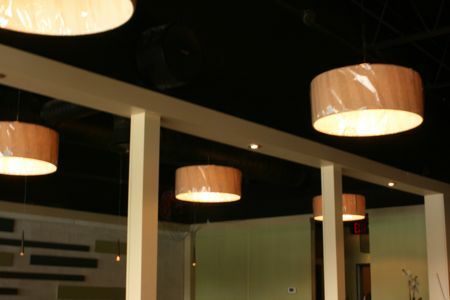 The owners Mike Karkut, Derrick Lathan, and Bradford Bobbitt were very involved in the process of renovating the space. Derrick’s Dad, Richard Rodger’s owner of Houseworks is the contractor. 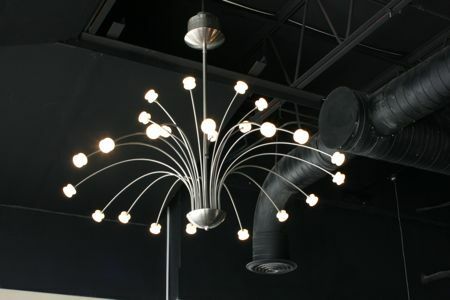 Erika was happy that the guys approved this chandelier. She made sure all of her choices were something they all approved of. For example, she presented three concepts for the design of the back bar. They chose a multicolored horizontal motif in grays and greens reminiscent of Piet Mondrian, the father of modern abstract art. Erika emphasized the importance of using the right materials in restaurant decor. She chose commercial grade finishes and fabrics that are “double rub”. Restaurants get a lot of wear and it is very important that the design looks good continuously. To interview Erika Nadolny email her at elnadolny@yahoo.com to read more about Graze check out the very good City Paper article and interview by clicking here.